A Hotdog in GTA San Andreas (Rear quarter view). 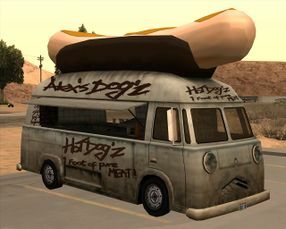 The Hotdog is a mobile catering vehicle in Grand Theft Auto: San Andreas. Designed as a large, old van with with an oversized roof-mounted hotdog, the Hotdog is a hotdog van that can usually be found at special events, or generally at places where people need food. By walking into the red marker, the player may buy a hotdog from the van to replenish their health. The van can be stolen and driven around by the player, while the hot dog vendor inside cowers in fear, thus disabling the food stall. However, the vehicle's poor performance, characterized by its slow acceleration, speed and heavy handling, makes the Hotdog an unpractical vehicle for demanding driving, although its size and weight makes the vehicle more resilient to damage, as most large vehicles do. The vehicle itself appears to be a '60s style van, possibly a 1964-1970 Dodge A100 but is extremely overscaled. The default radio station in the Hotdog is K-DST. While you can auto aim at the vendor inside the van you cannot shoot him, except when you're using a shotgun like the SPAS 12. When you steal the Hotdog the vendor will cower in fear underneath the counter, leaving you unable to buy anymore food. Also, you can still hear the vendor screaming in the back the entire way. When you park the truck the vendor will reappear and you are allowed to buy hotdogs again. When you steal the van and throw it into the ocean, the vendor will not die, but still cower in fear. West of Hampton Barns, south of the Fallow Bridge. The beach on the north side of the Panopticon. 69 Gas Station near the freeway in Flint County. Outside a rest stop in Las Payasadas, Bone County. In the parking lot beside Regular Tom. In the parking lot on the east side of the Sherman Dam. Beside a road near Dillimore. In the parking lot of the Burger Shot restaurant in Garcia. Hot Dog Van, GTA 2 equivalent. This page was last modified on 11 January 2013, at 14:45.